Bet you didn't expect this for Christmas! Who doesn't love old typewriters? Not sure what to do with this little drawing, I mocked up some wrapping paper, and I think it turned out cute! I am on a printables spree! Here's a small sweet card for a loved one. I found a photo online and re-drew the animals, but they were really embracing like this. If you're curious why I was looking online about cats and dogs - see below! It's a card with front and back, just score and fold. Two per 8.5'' x 11'' sheet. I have a funny, happy, feisty little companion named Texas. Having grown up around big dogs, I always held a common predisposition against cats. But along came sweet Texas, needing a home. He's incredibly communicative and demonstrative; he cuddles and gives kisses, lets us know when he needs to go out, crawls into bed between us during thunderstorms, nips at our ankles in the morning if we are not giving him adequate attention. Outside, he's the Neighborhood Tough. Not that he ever fights; he's quite friendly with all the other cats and especially protective of the poor skinny strays. They all follow him around in this little feline street gang. Needless to say, I love my Texas as much as any other pet I've ever had. We've moved to a large apartment that allows small dogs. At the end of our lane is a park, and at the back of our apartment is a lot of grass and land. I always wanted to take in a dog from the shelter and make our home even livelier, especially if we happen not to have children right away. Our schedules allow for one of us to be home every couple of hours during the workweek, and evenings and weekends. John has agreed, and we've done some research about breeds. 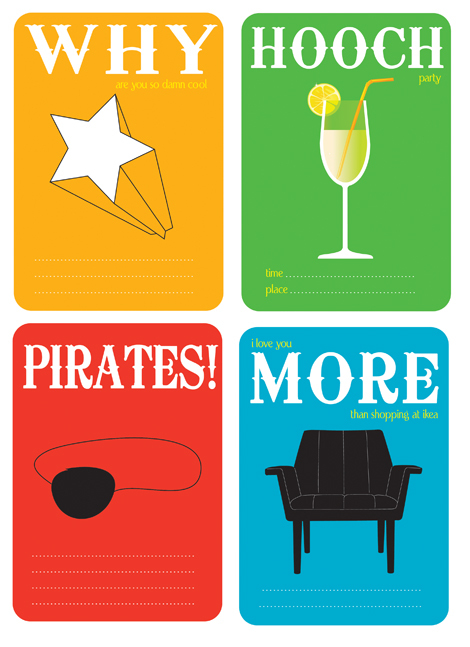 I made a grab-bag assortment of little notes and cards - help yourself. I like the "ikea" one at the bottom...let me know what you think!